The issues related to low value/trash fish landings from multi-species/multi-gear fisheries in the Asia-Pacific region are underpinned by the rapid development of the aquaculture industry and the increasing demand for fish by consumers. The fisheries that have evolved under these two pressures represent new challenges for sustainable fisheries management in the region. Several issues concerning low value/trash fish need to be resolved in order to ensure that fisheries of the Asia-Pacific region contribute more to the regions increasing use of low value/trash fish for aquaculture and other animal feeds; competition between use of low value/trash fish for fish meal versus use of low value/trash fish for human food; sustainability of the current system; amount of fish that becomes trash due to poor handling and post-harvest strategies; growth overfishing - harvesting of juveniles of commercial species; and discarding of unwanted fish. Recognising the potential effects of declines in the marine capture fisheries, many governments in the region have turned to aquaculture as a means to increase fish supply, provide employment and generate foreign income. On the one hand, aquaculture development can be seen as a viable option to utilise low value/trash fish and yet, on the other hand, it is contributing to increasing fishing pressure on the already overexploited fish stocks in the region. It is currently acknowledged, by both scientists and managers, that coastal resources are being "fished down the food chain" and the percentage of low-grade low value/trash fish has risen considerably in recent years. Over the last decade, the price of low value/trash fish has also risen considerably and it is predicted to increase over the next few years due to increased demand for fish meal and fish oil to meet market demands for aquaculture of carnivorous fish (and well as a source of affordable food). Given that aquaculture is predicted to grow while capture fisheries remain stable, it will become increasingly more difficult to meet the demand for low value/trash fish. World aquaculture production of fish, crustaceans and molluscs reached 42.3 million tonnes in 2003, excluding 12.0 million tonnes of seaweed. Aquaculture by China - the largest producer - amounted to 29.8 million tonnes. Other major producing countries in 2002 were: India (2.2 million tonnes), Indonesia (9 993 000 tonnes), Bangladesh (857 000 tonnes) and Thailand (771 000 tonnes), cf. Figures 5 and 6 (FAO, 2005). In 2003, a total of 10 producers from the Asia-Pacific region are in the top 20 marine producers while 13 are in the top 20 for inland areas (Table 6). FAO estimates that an annual global production increase of 3.3 percent until 2030 is feasible in the aquaculture sector (FAO, 2002c). IFPRI (2003) gives an estimate of some 2.8 percent until 2020. The production of high-value species will increase the most given the rising demand for these fish products. The biggest rise in production is expected to be in China. However, the expansion of aquaculture is dictated by a number of factors. The availability of suitable ecosystems and clean water, the role of pollution linked with intensive aquaculture and options for increasing fish density will all have an important impact on possible expansion. One of the main constraints on increasing aquaculture production is the development of cost-effective feeds and feed strategies (Edwards et al, 2004). Source: FAO (2005) and FAO database. "A great proportion of aquaculture production comes from developing countries, where aquaculture will continue to contribute to peoples livelihoods, employment and trade." Source: FAO (2004b) and FAO database. Note: * Excludes aquatic plant production. Developing countries will continue to export high value products (e.g. brackish-water shrimp, marine finfish and pellet-fed tilapia) and import or domestically produce fish of lower value for consumption (e.g. carp and mussels). Coastal aquaculture, particularly farming of brackish-water shrimp and carp culture in freshwater ponds, has developed rapidly. In many areas, these culture practices have been transformed from extensive systems to semi-intensive and intensive culture systems, where large amounts of feeds are required. There is concern that the rapid expansion of aquaculture may be constrained in the future by dependence on low value/trash fish and fish meal which are used as aquaculture feed ingredients (Tidwell and Allan, 2001 and New and Wijkström, 2002). There has been a prominent debate of the relevance of the so-called "fish meal trap". It is well known that the preferred protein source in most aquaculture feeds is fish meal. This implies that the natural limits of the supply of fish meal and oil will in the future restrict the development potential of global aquaculture, since the culture of many species rely on fish meal and oil for growth. Some regard this to be only partly relevant in the shorter term, as aquaculture is only one competitor for global fish meal supplies. The demand for livestock is still greater than aquaculture, although this is gradually shifting. A second consideration is that the fish meal component of feeds could be replaced by vegetable protein (e.g. soya) or mono-cellular proteins. An impact in the longer term of such replacement will tend to be lower growth rates of cultured fish (fish-based feed contain higher quality proteins resulting in greater growth if compared to vegetable-based feed). Prices of fish meal and oil will also tend to rise as competition between the aquaculture and livestock sectors increases (it is perhaps worth noting that chicken, cattle and pigs do not naturally feed on fish and therefore the inclusion of fish meal in feeds for these animals is a nutritional/economic convenience rather than absolute necessity - the same cannot be said for carnivorous fish!). 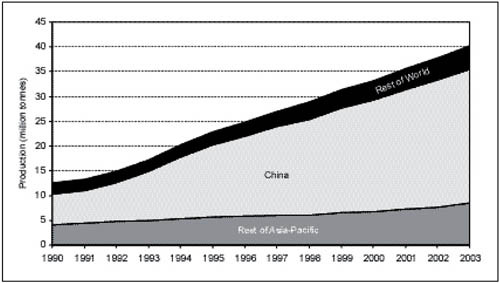 However, if one accepts that supplies of low value/trash fish are declining and prices are increasing, the Asia-Pacific countries may need to increase imports of fish meal from the global fish meal market for the aquaculture industry, or replace them with other feed materials, including plants and other protein supplement. The replacement of fish meal in aquaculture diets is hence a major international research priority. Countries like Thailand, China and the Philippines rely more heavily on low value/trash fish as raw materials for aquaculture feed, compared with India and Bangladesh. As there are constraints to semi-intensive and intensive forms of aquaculture in Bangladesh, demand for low value/trash fish as fish meal is likely to remain low. Fish meal and oil is today traded on a global market, where prices are being determined by global supply and demand. Peru and Chile are the sh meal and oil and the Pacific fisheries of these countries are essential for sustaining the global supply. This supply is heavily affected by the El Niño was low and global prices were high. The high prices of fish meal compared to other inputs (e.g. around $0.80 per kg while snail meat costs only about $0.08 per kg) is also another factor limiting growth. The proportional use of fish meal and oil for global aquaculture has also risen dramatically in recent years. Wada et al (2004) show that in 1988, some 10 percent of fish meal and 16 percent of fish oil were used for aquaculture purposes. By 2000, this had risen to 35 percent and 54 percent, respectively. The expected expansion of aquaculture will place further pressure on global demand and prices. Prior to the 1970s, the main species cultured in Chinese marine fishing areas were seaweeds and molluscs, while herbivores and filter-feeding fish species (e.g. Chinese carp) dominated freshwater aquaculture. There were no feed manufacturers for aquatic animals. With the introduction of high-value species (e.g. shrimp) in the late 1970s, the home-based feed processing model quickly failed to meet the increasingly high demand for high-quality feed, and this stimulated the development of the fish feed industry. The development of the feed industry further induced the private sector to engage in the farming of more high-value species in the late 1980s and early 1990s, resulting in the expansion of aquaculture output. Here, feed related issues have been alleviated through the sponsoring of research in feeds and nutrition, the establishment of a regulatory framework for the development of the feed industry, and the provision of economic incentives to investors (e.g. preferential tariffs on raw materials for feed manufacture). This policy has been in line with the overall government policy of pushing for the Chinese populations full participation in the sector, where the primary goal has been fish self-reliance (FAO, 2002c). The rapid expansion of the aquaculture and poultry industries has resulted in the development of fish meal manufacturing plants in many parts of China. At the beginning, much of low value/trash fish used for fish meal production were unidentified fish species, but now Japanese pilchard and Pacific herring are mostly used, along with other low value/trash fish species such as Japanese anchovy, Japanese sandlance, sardine, catfish and black scraper. As raw materials are limited and demand is high, most feed manufacturers accept any species that are available. In China, there are currently about 12 000 feed mills producing various kinds of animal feeds, including fish feed. Of these, about 1 900 have a production capacity exceeding five tonnes per hour. The state still plays an important role in the production of feed for aquatic animals and owns slightly more than 47 percent of the mills, although this is down from 99 percent in 1990 (FAO, 2002c). In the last ten years, domestic fish meal production has increased fourfold from 100 000 tonnes in 1992 to 400 000 tonnes in 2002, with production peaking in 1999 at 755 000 tonnes. This production, however, is not sufficient to cover the high demand and thus China has become the biggest importer of fish meal in the world. It is estimated that about 13 to 18 million tonnes of formulated feed are needed, but domestic production is still at around 5 - 6 million tonnes. The imported amount is reported to be as high as one million tonnes. The Chinese government has been very concerned about resource overexploitation and thus has restricted marine fishing. This has resulted in the decline of low value/trash fish landings, which consequently affects fish meal and fish oil production. The government policy seems to conflict with this resource conservation, however, as there is also promotion of the transformation from omnivorous freshwater fish culture to high value carnivorous species. Requirements for low value/trash fish and fish meal for aquaculture will certainly increase, while competition will increase in other countries that are also expanding their aquaculture industries. Increasing emphasis on export promotion in India has led to the development of aquaculture, although there is very strong domestic demand for freshwater fish. Aquaculture shrimp production has steadily increased and reached 114 000 tonnes in 2001. As the trend continues, use of low value/trash fish for fish meal production is likely to expand. Estimates of fish meal used to produce shrimp in 2001 were 41 000 tonnes and 200 000 tonnes per year for Indian major carp. Using these estimates and considering that the trend is likely to continue, about 270 000 tonnes of low value/trash fish may be needed to produce fish meal for aquaculture in India. Following the trend in the past ten years of aquaculture development in the Philippines, an annual growth of 6 percent is expected. This level is expected to be sustained, as the government has focused on promoting this sector to supplement marine capture fisheries landings. It is estimated that about 226 000 tonnes of low value/trash fish is needed for fish meal production and direct feed in aquaculture. Considering that domestic production of low value/trash fish is only about 78 000 tonnes, a significant proportion of fish meal used for aquaculture must be imported. It is also likely that a substantial part of feeds used in aquaculture are natural (or supplemental) rather than complete formulated aquafeeds. Fresh low value/trash fish are used to directly feed sea bass and grouper in cage culture on the Gulf and Andaman coastlines of Thailand. Production is 9 262 tonnes, which implies a low value/trash fish requirement of approximately 65 000 tonnes (FCRa of 7:1 fresh to fresh). This amount is relatively small when compared to demand of fish meal from coastal aquaculture, especially brackish-water shrimp farms. An estimate of fish meal needs for aquaculture production is about 248 000 tonnes per year. As in other countries, use of feed substitutes, such as soybean, have been increasing and will influence the demand for low value/trash fish. Demand for low value/trash fish depends largely on demand for livestock and aquaculture feeds. Approximately 51 - 68 percent of fish meal production is used in the domestic feed industry every year. The rest of the production is exported. Domestic fish meal demand and price have been increasing due to the expansion of the marine shrimp culture industry. In 1987, domestic uses of fish meal were 273 000 tonnes and increased to 734 000 tonnes in 1994. The average growth rate during that period was approximately 15.4 percent. The Animal Feed Producers Association reported in 2003 that 606 000 tonnes of low value/trash fish were used as raw material for animal feeds, 41 percent of which was used for aquatic animal feed, while 22 percent and 20 percent were used for chicken and pigs, respectively. There has been a dramatic rise in the use of low value/trash fish in aquaculture with the development of marine cage culture of grouper and lobster, and the expansion of Pangasius species culture in cages, ponds and, more recently, pens. There are no official data on the use of low value/trash fish in the aquaculture industry in Viet Nam although an estimate can be made from the farmed production of species that are fed low value/trash fish. Most recent estimates of low value/trash fish used for inland and coastal aquaculture ranged from 64 800 tonnes to 180 000 tonnes and 71 820 to 143 640 tonnes, respectively. The total amount of low value/trash fish used for aquaculture in Viet Nam was estimated to be between 176 420 and 323 440 tonnes. There is concern that in the future the rapid expansion of aquaculture may be constrained by increasing dependence on low-value marine low value/trash fish and fish meal. From a reported aquaculture production of 0.65 million tonnes in 1999, the Vietnamese government is planning for production to double to 1.15 million tonnes by 2006, and triple to two million tonnes by 2010 (cf. Appendix 2 for further insight). The price of low value/trash fish has risen over the last 3 - 5 years. The main reason for this is the increasing demand for low value/trash fish for feeding fish and livestock. Future expansion of aquaculture using local supplies of low value/trash fish is likely to be constrained with grouper farmers already reporting that they could not afford to buy it when the price rises. It appears that farmers raising higher value lobster can still afford to purchase relatively expensive low value/trash fish. At least 90 percent of fish meal is imported. Some 150 000 - 200 000 tonnes of fish meal will be required over the next decade for aquaculture, two to three times the present level of use. However, the price of imported fish meal continues to rise. Furthermore, there is an increasing trend to use pelleted feed because of poor water quality in culture using "home-made" or "farm-made" feeds based on raw fish and/or crustacean by-products. Almost all shrimp culture is based on pelleted feed and the proportion used by Pangasius catfish farmers has reached 10 - 20 percent. Attempts are also being made to feed marine finfish and lobster with pelleted feed. There is also an increasing conflict between the use of low value/trash fish for animals/fish and for human consumption. Supplies of low value/trash fish are finite, and as indicated by a recent increase in price, demand is outstripping supply. It has been argued that it would be more efficient and ethical to divert more of the limited supply to human food, using value-added products, etc. Proponents of this suggest that using low value/trash fish as food for poor domestic consumers is more appropriate than supplying fish meal plants for an export income oriented aquaculture industry, producing high value commodities. On the other hand, food security can also be increased by improving the income generation abilities of poor people, and it can be argued that the large number of people employed in both fishing and aquaculture has this beneficial effect, via income generation, rather than direct food supply. Nam. Traditional small-scale pig rearing uses low value/trash fish but large-scale pig farming uses agro-industrial formulated feed containing fish meal. As a result of the expansion of aquaculture (and local livestock production), low value/trash fish has a ready market and can be sold easily in many localities. This can then be converted into higher-grade fish/crustacean (and livestock), some of which are sold at good prices. Hence, there seems to be little incentive to discourage the harvesting of low value/trash fish given their important contribution to aquaculture, overall employment and consequent export earnings. Also, the low value/trash fish catch is based on a large number of short-lived highly productive species for which, apart from targeted low value/trash fisheries in China, there is little evidence of current overexploitation leading to a reduction in overall fish production. The demand for low value/trash fish has led to increased levels of low value/trash fishing by small-scale vessels in particular, and is now an important reason why many vessels can continue to be economically viable and remain in fisheries. It has been argued that overfishing has reduced the grazing pressure on small fish by larger predatory fish, and small species have increased in abundance, for example pony fish. It is indeed a rather interesting notion that overfishing in the region has allowed the biomass levels of low value/trash fish to improve. The current situation also results in little apparent wastage from the ecosystem (i.e. no discarding). However, it should be acknowledged that there is little available evidence of what impacts the current (and probably increasing) exploitation are having on the overall ecosystem. The concern, to both fisheries and aquaculture, is that there is no way of knowing how sustainable this system is. It is possible that the multispecies tropical nature of these fisheries can sustain such exploitation patterns, although if one traces the history of development of fishing in heavily fished countries such as China, one question is how long this can continue. There is emerging evidence that continued heavy exploitation pressure on even the annually recruiting species can lead to overfishing and a consequent decline in production, e.g. Japanese anchovy catches in China. The WorldFish Centre is currently doing analyses of low value/trash fish trends in several countries based on past scientific trawl surveys that may improve our knowledge on this critical issue. Reduced fishing capacity may, in fact, result in increased catches for a smaller number of vessels, although it will be difficult to reconcile who would be refused access to the resources. From a socio-economic perspective, the benefit of catching low value/trash fish is obvious. The low value/trash fish are an important food source for many people, especially the poor, as well as an important source of income. The range of utilisation of these low value/trash fish for human consumption suggests very little waste associated with them. However, serious conflicts over use are common. Trawlers in the region tend to operate close to shore and use very small mesh sizes. They thus cause conflicts with small-scale sectors and destroy fisheries stock and ecosystem services. Government measures have attempted to eliminate and resolve these conflicts through banning trawling in the western half of Indonesia, heavy restrictions in some areas of the Philippines and Malaysia, prohibition from within three km from shore in Thailand, and within 40 m depth in Bangladesh. Such regulations are unfortunately difficult to enforce and success has been rather limited, unless supported by local communities and administrations. Increasingly, small-scale fishers are the main endorsers of responsible fishing practices, through community-based and co-management programmes, often with strong support from local government. Overall knowledge of the dynamics of these low value/trash fisheries must be enhanced. Serious efforts to improve statistical records of low value/trash fish, and to identify and quantify where and how these low value/trash fish are used, is urgently needed. The composition of landings must be identified and probably categorised in the national catch statistical system (certainly for major species), such that groups like "other fishes", "miscellaneous", "low value/trash fish", disappear. Local communities can assist in recording the amount of catches of these fish at small landing sites. Knowledge about who uses the fish and who benefits from their use are also fundamental. This will inevitably require supplemental information gathering beyond catch records that utilises local knowledge to support conventional statistical approaches. Another aspect of the sustainability issue is that the low value of low value/trash fish does not reflect their high ecological value. These small fish serve a niche in the marine ecosystem and are certainly food to other fish and marine animals. Removing them in large quantities from the environment creates a void in the food chain, and could eventually lead also to the reduction or loss of larger fish species, not just of its own species. Fishing with demersal gears that destroy habitats adds to the overall ecological impact. what are the costs and benefits of diverting low value/trash fish away from animal/fish feeds into more value-added products? Because less money and effort is needed to be spent on handling and there is a market that can accommodate the catch, some larger fish are caught and included as low value/trash fish for fish meal and fish oil. Indeed, it is clear that with high demand and good economic gains of low value/trash fish from the fish meal production sector, many have decided that careful handling and chilling is not essential. According to some reports in Viet Nam, 20 - 30 percent and even 50 - 60 percent of high value fish on some offshore trawlers becomes waste because of poor storage. Even if it were theoretically possible to improve the product, the limiting factor of small-scale and artisanal vessels is the lack of chilling equipment and on-shore infrastructure to access high value urban or export markets. Hence it may be difficult for these vessels to land a high quality product for the human consumption market without incremental increases in infrastructure and costs. With proper handling, landing and supply of high quality fish to local markets should still be possible, where fishing grounds are close to port. Of greater interest are perhaps the industrial vessels, which with the proper equipment and skills, should be better at ensuring a high quality catch. The underlying incentive for this to materialise, however, is that the economic gains of doing so outweigh the gains of landing fish on the low value/trash fish market. Here it is fundamental that the national authorities establish appropriate policies to help structure the sector, especially in relation to the national goals of food supply to the population versus income generation. Indeed, as long as the low value/trash fish market is vibrant then fishermen will have few incentives to improve the overall quality of their landed catch. The quality of low value/trash fish destined for feed-mill factories is also a major concern. Even though it has a high protein content and quality when caught, the quality declines rapidly as only ice or chilled water is used to preserve it on board ship, especially when boats may be at sea for 1 - 4 weeks. The resulting quality of the fish meal is often poor because low value/trash fish is degraded by the time it reaches the fish meal plant, hence limiting its use to lower product-value aquaculture operations. Another related issue of low value/trash fisheries is the capture of juvenile fish of potentially important commercial species (so-called growth overfishing). As stated earlier, between 18 and 32 percent of low value/trash fish in the Gulf of Thailand are juveniles of commercially important fish species. Given a chance to grow to a larger size, these high-value species could be harvested much more effectively, both in terms of total catch of these species, but more importantly, in terms of value. However, to increase the catch of these species, a dramatic reduction in overall fishing effort would be required and the overall lower quantity of catch would then have knock on effects to markets and aquaculture. As with the current system of using low value/trash fish for aquaculture, this higher value catch would still be supplying the wealthier parts of the population. Social costs in terms of reduction in employment and livelihoods would be large and the actual economic benefits (and distribution of benefits) need to be studied in greater detail. In Bangladesh, bag net fisheries are highly non-selective, and can cause high damage to migratory coastal and estuarine species. This type of gear basically restricts the migration of juvenile marine fauna to the sea to complete their routine lifecycle and thereby reduces the total catch of the coastal fisheries, as well as reducing the chances of the total regeneration capacity of the stock. Juvenile/trash fish excluder devices (JTEDs) have been trialled in trawl needs in several Southeast Asian countries. However, given the many conflicting uses for low value/trash fish, it is difficult to envisage a management system that optimises the supply of low value/trash fish for both human and livestock/fish uses and at the same time excludes juvenile fish. Socio-economic studies are required to assess the costs and benefits of different management interventions such as juvenile fish excluder devices in nets, etc. Discarding practices are seen by many as a waste of fish and fish protein, although it has to be realised that the impact on the species taken is the same whether they are landed or not. In fact, the discarding practice will benefit some species in the ecosystem, such as scavengers, if carried out in large volumes. Obviously the degree of discarding varies according to the market available to the fishers and can vary considerably by gear type and location. It is nevertheless clear that discarding at sea will decline if unwanted catches can be landed for economic gain. International instruments, including UN Resolutions, the Kyoto Declaration and the Code of Conduct for Responsible Fisheries, have highlighted the need to reduce, or minimise discards. There are two principal approaches to addressing the discard problems; namely a) reducing bycatch and b) increasing utilisation of bycatch. These two harvest strategies may be complementary and in any given fishery, an appropriate balance between bycatch reduction and utilisation is required (FAO, 2004a). Again there is a need for analyses of the trade-offs between promoting bycatch reduction and utilisation. In particular, the balance between highly selective fishing which targets one trophic level (or species) only, and less selective fishing which is likely to impact upon several trophic levels (or species groups), requires further attention so that the best scientific advice can be made available. Examples of bycatch utilisation legislation in Asia-Pacific countries are given in Table 7.
intervention of fisheries management (e.g. regulatory measures, improved enforcement, "no discard" legislation). For the Asia-Pacific region, the greater utilisation of low value/trash fish has been of particular importance. Indeed, with some exceptions, discards in most fisheries in China and Southeast Asia are now considered to be negligible. There has been a change in perception of what constitutes a target species. Given the expansion of markets for low-value fish, almost all catches can now be regarded as "targeted" (i.e. no bycatch or discards). Exceptions will of course occur. In Brunei, contrary to other Southeast Asian countries, no low value/trash fish fishing is allowed (for aquaculture or local consumption), and hence a discarding estimate of some 70 percent is still being quoted. FAO (2004a) estimates that trawl fisheries for shrimp and demersal finfish account for over 50 percent of total discards, while representing only 22 percent of total landings. Trawl fisheries and tropical shrimp fisheries account for over 55 percent and 27 percent of the total estimated discards, respectively. Small-scale fisheries account for at least 8.5 million tonnes (11 percent) of discards. In the analysis, most small-scale fisheries in the Asia-Pacific region were assigned very low or zero discard rates, given the supporting expert evidence summarised in Table 8. Fisheries with high discard rates include the Bangladeshi industrial finfish and shrimp trawl that has an estimated discard rate of some 80 percent. The high discard rate for Brunei is due to extensive discarding in the multispecies finfish and shrimp trawl fisheries, based on 1998 figures, and likely reflects the greater purchasing power of the population and the lack of markets for lower valued species. Discarding in the Indonesian shrimp trawl fishery in the Arafura Sea is estimated to be over 80 percent, based on 1998 figures. Here discards have remained high, despite the introduction of bycatch exclusion devices, largely due to poor enforcement and the lack of local markets for bycatch. Increasing quantities of fish are being exported overland from growing demand in southeastern China (FAO, 2004a). A number of national bycatch reduction initiatives have also been implemented (Table 9). Despite the best intentions of these bycatch reduction measures, problems with enforcement and user conflicts have been observed. Reports from the countries studied show, in general, lower discarding figures than those estimated by FAO (2004a) although they all indicate that a certain amount of catches from trawls and push nets are directly discarded because of high grading (i.e. keeping more valuable species which earn a higher market price and discarding less valuable sizes of fish) to provide storage space for higher value fish. Edwards et al (2004) concludes that one reason for insufficient supply of low value/trash fish for fish meal manufacture is because about one third of the fishery catch is thrown overboard. Fishers need improved technology so a higher percentage of the catch can be landed. In general terms, the retention of low value/trash fish at sea to eliminate discards, as well as gear modifications and improved fishing methods to eliminate bycatch and discards, could be useful. It is estimated that during the early 1990s over 10 000 tonnes of low value/trash fish were discarded and wasted at sea. The discards, however, rose along with the increased efforts (more vessels and more gears) over the last decade and have been estimated at around 20 000 tonnes during 2001/2002. Fisheries with relatively high discards are set bags with non-mechanised boats (6.6 percent of total catch), shrimp trawls (6.2 percent), and gill nets (5.2 percent). When freezing capacity is limited, low value/trash fish that would fetch a low profit margin are discarded at sea, to make space for other high value fish. Low value/trash fish also are also very perishable, and with a lack of processing equipment on board, some fishers discard low value/trash fish at sea. Discards in Indonesia are considered insignificant as everything is used for home consumption or for commercial purposes, except for the Arafura Sea shrimp fishery. There is hardly any waste in Indian fisheries, i.e. everything landed is used in one form or another. Even the poorest quality of fish is left on shore to dry to be used as feed for animals. Wastage of low value/trash fish occurs from discarding at sea by the capture fishery sector, especially commercial fishing boats where high grading of catch occurs. Low value/trash fish consumes added effort, space and costs (ice). In addition, higher discarding rates and sorting preference in this sector are associated with longer days spent at sea, distanced fishing grounds and landing areas. The seasonality of catch also plays a factor in the discarding process. During peak season and when harvest of commercially valuable species is high, low value/trash fish are even discarded at times by fishers since the market is flooded with better quality fish and market price is too low, or when the volume collected is negligible. Based on onboard observations, it is estimated that discarding can be as much as 25 - 30 percent of the trash catch for trawl and push net. During the lean season, however, landing of low value/trash fish is high and commands a better market price. Information on discarding non-valued fish by type of fishery is available only for the push net and trawl fisheries. The discard rate for the push net fishery is around 12 percent of the total catch while in the trawl fishery, 10 percent are discarded at sea. Observations on the composition of non-valuable fish discards include fish known to be fatal when consumed or those species that could pose a danger while sorting. Some fishes discarded are lionfish, pufferfish, anglerfish and eels. Lately, however, even pufferfish has found new markets in the Bicol region in dried form. In the municipal sector, it is customary that as long as markets for certain species exist, fishers will try to bring ashore all they can harvest. The "harvest all" mentality is usually observed due to accessibility of the fishing grounds and landing areas. There is some wastage of low value/trash fish as some are discarded at sea due to their low quality. Before 1975, there were not many fish meal plants and only 50 percent of low value/trash fish produced was utilised. At present, fishers do not discard much low value/trash fish, as they can sell them to fish meal plants. A fishing fleet has been reported to be specifically targeting low value/trash fish, as this is more financially beneficial than trawling for more valuable species with low value/trash fish as a bycatch (NIRAS, 2001). Discarding will be a concept that is irrelevant if the trend continues. China, India and Thailand, all with low or negligible discard rates, account for over half of the penaeid shrimp catch.